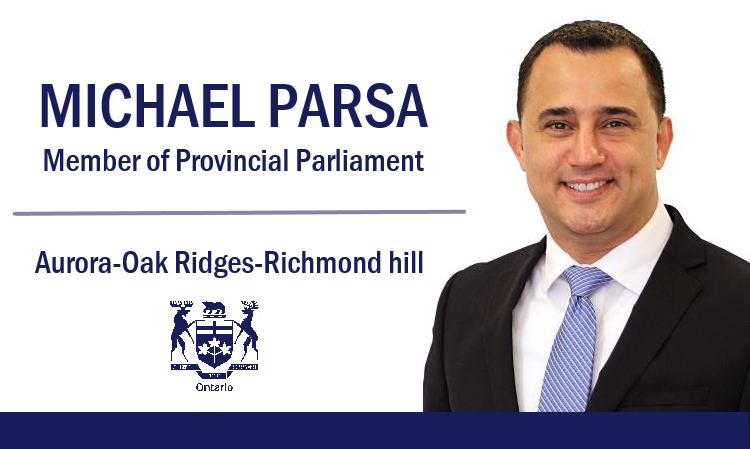 Michael Parsa was elected to the Ontario Legislature on June 7, 2018, in his home riding of Aurora – Oak Ridges – Richmond Hill. Michael is deeply committed to serving the public and has a long-standing reputation of actively engaging with various communities and organizations within the region, and beyond. He has previously worked and volunteered with the town in a variety of ways including, helping support initiatives for at-risk youth, personal mentorship and empowerment. In addition to his role as MPP, Michael was appointed to serve as Parliamentary Assistant to the Minister of Economic Development, Job Creation and Trade, overseeing the file of Small Business. In this role, he supports small businesses across Ontario to thrive, create jobs and grow the province’s economy. Michael holds a Bachelor’s Degree in Organizational Management, and previously ran his family’s small business which has been operating in the GTA since 1990. Michael also sits on the Standing Committee for Public Accounts. A strong proponent of family values Michael Parsa and his wife, Valerie, have been married for 18 years and have been living in the community since 2002.